What payment facilities are at the lodge? Snowgum and Ramat Niseko conduct mostly all transactions in cash. It is for this reason, that we ask you to please bring an appropriate amount of Japanese yen with you. For locations on the nearest ATM’s are please read our “Money” section in Travel Info. However, we do have the ability to transact some larger amounts by Credit Card. This form of payment can be some times unreliable and it therefore a good idea to keep enough cash on you to finalise your bill in Japanese yen. How far is the lodge from the Hirafu gondola and bottom ski lifts? Ramat and Snowgum Lodges are just over a kilometre from the centre of Niseko Hirafu Village, which is the main village of the world famous Niseko ski fields. The free Grand Hirafu shuttle runs daily between 8.30am – 8.30pm with the closest stop only 150m from the lodge (yellow dot stop 23) and only takes 5 minutes to get you to the gondola and about 7 minutes to the Welcome Centre. We also run an in-house first tracks shuttle service to get you to the ski lifts (only 2km away) for fresh tracks every morning. Have a look at our getting around page to see how easy it is to get around Hirafu Village. How far is the lodge from restaurants, convenience stores, supermarkets? Ramat and Snowgum Lodges are located in Izumikyo Stage 2, the East Village of Hirafu about 1 km from the centre of town and 2 kms from the ski lifts. There are 7 great restaurants and cafes in close proximity to the lodges, with the closest being a quaint little Austrian restaurant called Mozart’s, about a 2-3 mins walk. Another great restaurant just minutes up the road is the Soup Curry restaurant. Many guests to the Niseko area stop in here for a great Japanese curry and dabble in the opportunity to choice their own level of spice (1 – 20, and please choose carefully, 20 will blow your mind). Please have a look at the Map for more restaurants around the lodges and for a more comprehensive list of restaurants in the village here is the Wine and Dine Guide. There are 2 convenience stores located in the village; Lawson’s (map # 11) and Seiko Mart (map # 12). Apart from the 2 convenience stores the only other place to get groceries from are stores located in Kutchan (the nearest town about 10mins drive away). 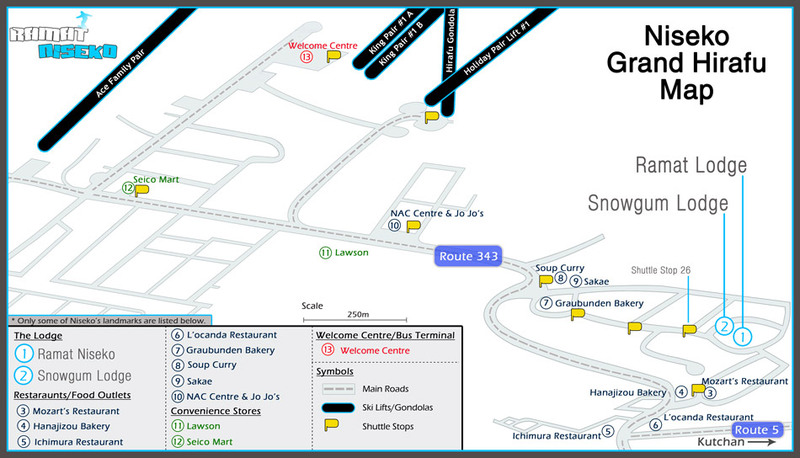 There are 2 super markets in town; MaxValue and Co-op which are easily accessible by the Niseko – Kutchan bus. For more information on restaurants throughout Kutchan, please have a the 2014 Restaurant Guide page. Also to help our guests get to the supermarkets in Kutchan our private shuttle will take shopping trips every second day* at 18:30. For more information please have a look at our ‘Private shuttle’ on the services page.